If you have a Batman fan (or are a Batman fan) who isn't really into the more pop culture themed paraphernalia, then this might be right up your alley. A lot of the branded items out there can be somewhat kitschy, which depending on your needs can be either awesome or awful. Some of us wouldn't hesitate carrying a logo-ed lunch box or bag to work or hanging a comic book cover in their office. But that might not be appropriate in all circumstances, which is why I love coming across higher-end, executive-looking art pieces that are themed after comic book characters. 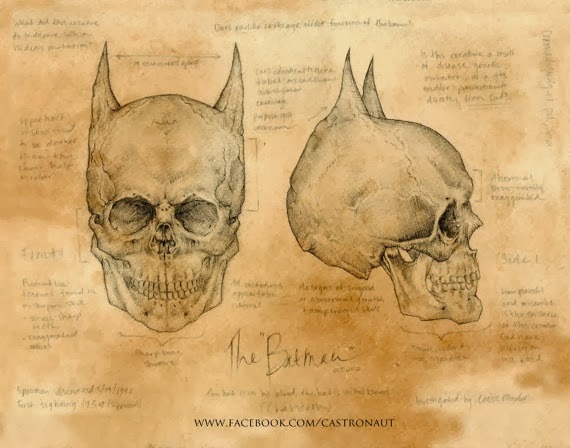 For instance, take this poster of an anatomical Batman skull. It has a scientific feel, with all the handwritten notes. The colouring is as far from cartoonish as you can get. It really feels like a whimsical piece that could hang in an executive's office. Or even my house. Available from Aetherium Emporium on Etsy.